Joos van der Beke or Joos van Cleve as he is commonly known, was a painter active in Antwerp in the first half of the 16th century. His early style reflects the influence of Memling and Gerard David, but his late work comes closer to the Italian Renaissance, even though there is no documentary proof that he ever travelled to Italy. Van Cleve included himself in his paintings as a spectator of the religious scenes taking place. On this occasion he has depicted himself in the traditional manner used in the Low Countries, with the body shown half-length and slightly turned, and the figure looking out at the viewer. The dark tones of the clothes serve to highlight the face and hands, one of which holds a delicate pink. This flower refers to nuptial portraits, and it may be that the present self-portrait formed a diptych with an image of the artist’s wife. 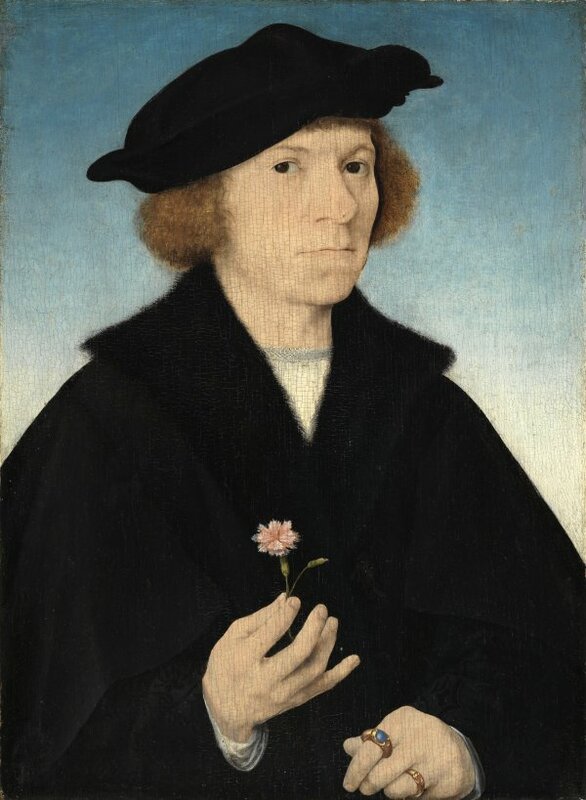 The date of this self-portrait has been placed around 1519 on the basis of the artist’s age when he painted it and the style of his clothing, which corresponds to the fashion of the time. Joos van Cleve depicted himself on a number of occasions in his religious compositions as one of the onlookers or the figures surrounding the holy protagonists. Some of these self-portraits were recognised by Jan Bialostocki, who detected the earliest self-portrait by the artist in The Resurrection of Lazarus in the altarpiece for the church of Saint Nicholas in Kalkar, on which Van Cleve collaborated with his master Jan Joest. Other later self-portraits include the ones in Dresden in which the artist is to be seen in two paintings of the Adoration of the Magi, both in the Gemäldegalerie of that city. In the first panel, dated to around 1517–18, he is seen standing full-length in the middle distance and talking to another man. In the second, later Adoration of around 1525 the artist is to be seen behind a parapet looking out at the viewer. He has also been identified as the figure of San Reinaldo on the exterior wing of an altarpiece now in the National Museum of Warsaw, completed in 1516. The similarity between all these figures and the sitter in the present panel has enabled this work to be identified as a self-portrait of the artist. Van Cleve adheres to Flemish models of portraiture formulated by earlier northern artists. He presents himself half-length against a graduated blue background, his left hand resting on a parapet that leads the eye into the pictorial space. In his other hand Van Cleve delicately holds a pink. The colour range is sober with an emphasis on very dark tones in the clothing, the fur collar and the hat. This tonality undoubtedly helps to make the figure stand out against the background but it also creates a slightly harsh effect. The fact that the painter is holding a pink has led to the suggestion that he depicted himself as a betrothed man. Van Cleve married Anna Vijdts in 1519. They had two children before her death in 1528, after which he remarried. It has been suggested that this panel could be the wing of a diptych that depicted his wife on the other panel. The date of the painting has been placed at around 1519, as Van Cleve’s appearance would suggest that he was approximately in his mid-thirties at this point. The style of the clothing is also appropriate to this dating, particularly the type of hat, which was popular in the 1520s. Two other pairs of portraits of couples by Van Cleve have been dated to this period: one of Joris Vezeleer and his wife Margaretha Boghe of around 1518 in the National Gallery, Washington, and another of an anonymous couple, dated 1520, in the Uffizi, Florence.